The Huntington Library, Art Collection and Botanical Gardens is located in the affluent community of San Marino, at the edge of Pasadena. The estate is the former home of railroad and utilities magnate, Henry E. Huntington, who was instrumental in developing the San Gabriel Valley. He bought the property in 1903 and built the mansion on the grounds in 1911. Huntington's second wife, Arabella, helped fill their mansion with a world-class collection of British and French art, much of which makes up the current art collection on exhibit in the house and galleries. Their book collection, which took multiple train cars to transport from New York, didn't fit in the house, so they added an entire new building, which was finished in 1921. The library collection includes the thousands of first editions, historic documents and volumes on the American West. Turning farmland into beautiful gardens was the project of landscape gardener William Hertrich. He created a showcase of diverse botanical specimens from native LA plants, local desert species and exotics from around the world. After Huntington's death in 1928, his foundation opened the Huntington Library, Art Collections and Botanical Gardens to the public, and they draw visitors from around the world. 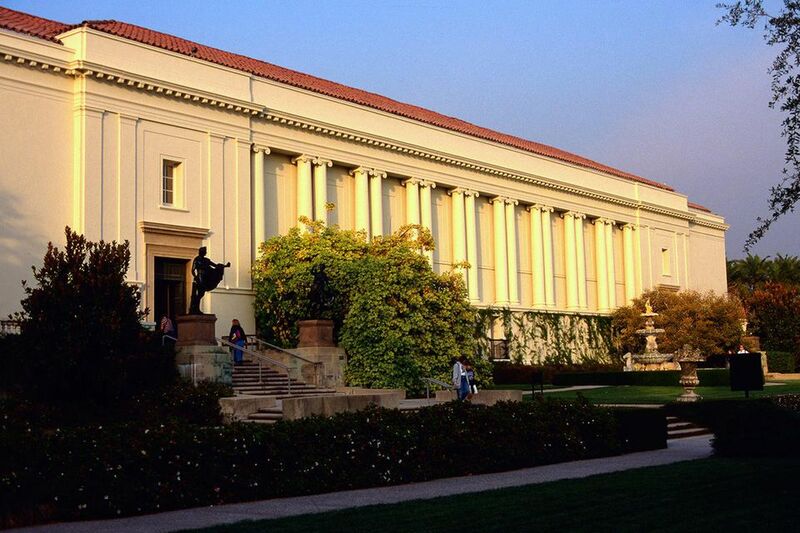 Unlike your local public library, most of the 5 million books, manuscripts, photographs and other works related to American and British history, literature and art are hidden away in the Huntington Library's Munger Research Center, available only to visiting scholars and researchers by special arrangement. However, the Library Galleries, which are open to the public, display some of the most famous pieces along with rotating exhibits. One of the highlights of the permanent exhibit is an original illuminated Latin Gutenberg Bible from around 1455. The Huntington's print set is one of the earliest works printed with movable type - one of 12 surviving vellum copies of the original 45 Johann Gutenberg printed in Latin in his workshop in Mainz, Germany. Only one of the two volume set is on display at a time. Another treasure of the collection is the 15th century Ellsmere manuscript of Chaucer's The Canterbury Tales, which Huntington purchased from the 4th Earl of Ellsmere; a double-elephant folio edition of Audubon's Bird's of America; and early editions of Shakespeare's works. Personal letters from Charlotte Bronte, Henry David Thoreau, Walt Whitman and Harriet Beecher Stowe can be found in the 19th Century British and American Literature section. American history documents include papers related to Abraham Lincoln and the 13th Amendment to the Constitution. Personal letters, articles, books and photos tell the History of the American West. The Huntington Art Gallery is housed in the Huntington's 1911 Georgian mansion. In contrast to the nearby Norton Simon Museum, which is a nice sampler, the Huntington has a more focused collection of French and British art, including an impressive group of elegant full-length Grand Manner portraits by Gainsborough, Romney, Reynolds and Lawrence. Two favorites, Gainsborough's Blue Boy and Lawrence's Pinkie, hang side by side in the mansion. The Virginia Steel Scott Gallery of American Art represents the history of American painting, sculpture, and decorative art from the late 17th to the middle of the 20th century in 16,000 square feet of gallery space. Items from the permanent collection include John Singleton Copley’s The Western Brothers, Mary Cassatt’s Breakfast in Bed, John Singer Sargent’s Portrait of Pauline Astor, Edward Hopper’s The Long Leg and Harriet Hosmer's Zenobia in Chains. Dorothy Collins Brown Wing of the Virginia Steele Scott Galleries houses the Green & Green exhibit. The famed Arts & Crafts architects Henry and Charles Greene who built the Gamble House and many other notable Pasadena properties. The exhibit, created in conjunction with the Gamble House/USC, includes a collection of furniture and decorative arts, a reassembled stairway from the 1905 Arthur A. Libby house, and a recreation of the dining room of the Henry M. Robinson House, designed and built in Pasadena between 1905 and 1907 with tables, chairs, sideboards, cupboards and leaded glass lamps. The Susan and Stephen Chandler Wing of the Virginia Steele Scott Galleries of American Art houses rotating exhibits from the collection. Beautiful Science: Ideas that Changed the World showcases scientific achievements from Ptolemy to Copernicus and Newton to Einstein. There are four galleries, highlighting astronomy, natural history, medicine, and light. Exhibits are pulled from the combined collection of the Huntington’s original history of science materials and the 67,000-volume collection of rare books and manuscripts from the Burndy Library donated to The Huntington in 2006 by the Dibner family. The Botanical Gardens at the Huntington is one of the Most Beautiful Gardens of Los Angeles. Many people who visit the Huntington Library, never go inside the Library or Art Galleries - which is kind of sad, because they're stunning - but spend their entire visit exploring the gardens. The Botanical Gardens has over 14,000 varieties of plants, mostly exotic ornamentals from across Southern California and around the world, organized into 14 themed gardens on 120 acres. You can explore on your own or take a garden tour. The oldest gardens are the Lily Ponds, the Palm Garden, Desert Garden and Japanese Garden which were designed by William Hertrich with the Huntingtons. The subtropical and Australian plants, herbs, camellia and Rose Garden were added later. Other garden areas include the Shakespeare Garden, the Jungle Garden, the Children's Garden and the Conservatory. The latest major addition is the Chinese Garden, planned to be the largest outside of China. The first phase, completed in 2008, includes a man-made pond lined with stones from China with multiple bridges and architectural elements on 3.5 acres of a planned 12 acres. The second phase is ongoing. Henry Huntington personally chose the location of each sculpture in the original gardens. Most of the pieces are from the 17th and 18th century and reflect classic. The 18th century limestone statues that flank the North Vista depict characters from mythology and folklore. Tea at the Rose Garden Tea Room is both traditional and informal. Traditional English Afternoon Tea with scones, cucumber sandwiches and other delicacies are served in an informal buffet for a flat fee. Reservations are recommended two weeks in advance. The separate Cafe is more of a snack counter serving sandwiches and grilled items with outdoor seating.